Sisters Rebecca, Alyssa, and Lauren Barlow have always been close to their family and placed God above all else in their life. They have always strived to be themselves - who God made them, and not conform to worldly standards. And now, they have the opportunity to share their passion and joy for Christ, as well as their stand for purity, with an audience bigger than they ever dreamed. After traveling the country for two years as the back up band for their dad, the girls began fooling around with drums, keyboards, ect. 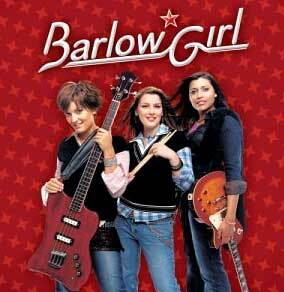 and songwriting and decided to start a band of their own, naming themselves "BarlowGirl." Their parents became their managers, and on October 14, 2003, BarlowGirl signed with Fervent Records. Their self-titled, debut album was released February 24, 2004. Since then, Rebecca (guitar, background vocals), Alyssa (bass, keyboards, vocals), and Lauren Barlow (drums, vocals) have been enjoying whole-heartedly this path that God has led them on and are in awe of the success that they have found so soon. BarlowGirl's album has sold over 250,000 units, making them the best-selling new artist of 2004. As well, they have been nominated for four Dove Awards and will also be performing at the awards show. Their breakout hit single, "Never Alone" was named "2004 Song of the Year" on R&R's CHR chart. They have toured with Kutless and Stellar Kart, and are currently on the road with Todd Agnew and Warren Barfield as part of the "In The Name Of Love" tour. This summer, BarlowGirl will be making several stops and Christian music festivals. An answer to prayer recently came when the girls finally got a bus. The bus, which was originally Barbara Mandrell's was a perfect fit for them and really seemed like home. Mandrell had been praying that it would go to a family and was actually holding out on selling it until God brought one along. It is truely a blessing to them and they are greatful to God for the "home away from home" they He has provided for them. BarlowGirl's songs are very personal to them, as they describe the journey that God has taken them on. Their favorite topics include trusting God, purity, and their stand on not dating. They belive that God is calling everyone to live a life that is fully surrendered to Him. BarlowGirl also takes a strong stance on remaing pure, especially in the area of clothing and modesty. Lastly, the girls believe that God has one perfect man set aside for them, so they do not feel the need to always have a boyfriend. They know that God will bring the right person along for them at just the right time. Both on and off stage, the girls of BarlowGirl and very honest about who they are and why they are doing what they do. They desperatly want people to understand that they are just like them and have much of the same struggles and hardships that they do. BarlowGirl want to help fill them with the hope and joy that can only be found in Christ Jesus. Just a few years before, they were all set to go their separate ways, but God showed them that he had a different plan for their lives - a plan that would allow them to be a part of a ministry they never dreamed possible. When not on tour, BarlowGirl is preparing for their next album set to be released in August of 2005. The songs on the next album will again be very personal and almost be like opening up their journal.